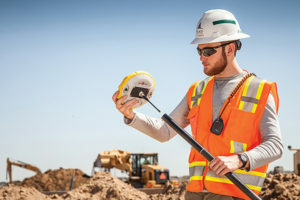 Trimble announced the expansion of its Site Positioning Systems (SPS) portfolio with a new, more affordable GNSS receiver – the SPS785 GNSS Smart Antenna. The smart antenna is a fully capable GNSS receiver that features the company’s high-quality GNSS accuracy at a lower price point. The receiver has full satellite coverage with the combination of GPS and all GNSS constellations. A seamless workflow with the Trimble Siteworks Positioning Systems means that everyone on the jobsite can use the same data and work on the same platform. For added protection, the receiver’s radio antenna fits inside the range pole. Its lightweight, compact design enables contractors to work longer with less fatigue. The SPS785 is suited for use on small and large job sites, and can be used for grade checking and navigating to points by grade checkers, construction surveyors, supervisors and foremen. It is also suited for recording features with attributes, images and volumes, simple positioning tasks or for use as a rover system or base station.